Commemorating the United States Army, the US Mint will release the 2011 $5 United States Army Commemorative Uncirculated Gold Coin sometime in 2011. The United States Army was founded in 1775 by an action of the Continental Congress with the looming Revolutionary War on the horizon. Since that founding, the Army has served the United States in both peacetime and war. In an effort to recognize the centuries of service provided by the Army, the National Museum of the United States Army is to be built in Fort Belvoir, Virginia. Surcharges from the sale of these coins will aid in its construction. Maximum mintage authorized by law on these coins stands at 100,000 $5 gold coins, 500,000 silver dollars, and 750,000 half dollar coins. Each US Army Gold Coin will be struck from 90% gold to the diameter of 0.850 inches with a weight of 8.359 grams. 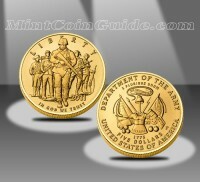 The US Mint released the Army Commemorative Gold Coins sometime on January 31, 2011. Initial price on the Army Gold Uncirculated Coins was $439.95 with that price increasing to $444.95 on March 2, 2011, at 5:00 p.m. ET. The US Army Uncirculated Gold Coin was struck at the US Mint’s facility in Philadelphia. 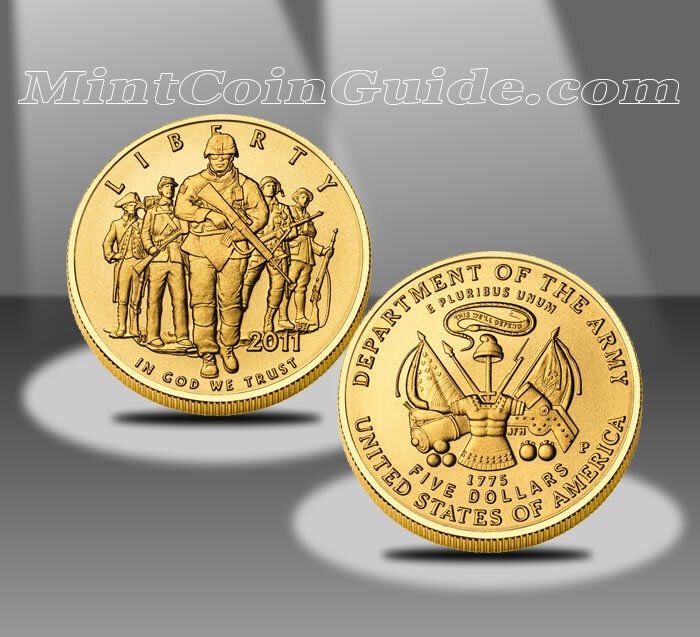 Accordingly, the obverse of the gold coin contains an image of five US Army soldiers representing the different eras they have served in US history – Continental, Civil War, modern, World War II and World War I soldiers. It was designed by Joel Iskowitz and sculpted by Phebe Hemphill. The reverse shows the US Army emblem and was designed by Joseph Menna.